Cassava Flour - A Wheat Flour Extender. 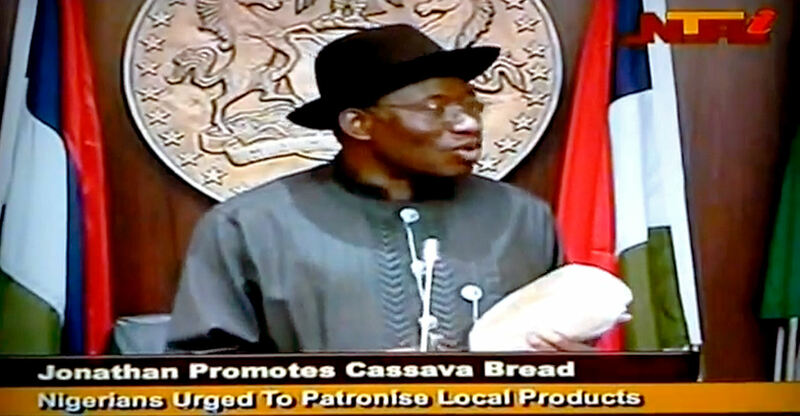 [<<] Nigerian President Goodluck Jonathan presenting IITA-developed bread with 40% cassava flour content to the members of the FEC, hinting at new national policy on bread content. Video grab from NTA1 newscast on 30 November 2011. Improved process for cassava flour. A new improved process for the manufacture of cassava flour has been developed. Using fresh cassava minimizes bacteria contamination and coloring of the end product. The cassava flour produced by this process is of high quality and prepared for food products. All you need is absolutely fresh roots, then a fully confined and automated process takes care of the rest. A continuous process insures stable production with low operating costs and a cassava flour of highest standard. The technique used has optimal removal of cyanides and produces a clean and hygienic food ingredient. The product will find applications in industrial wheat flour mills and bakeries as a flour extender, in breweries and ethanol plants as a fermentation booster and even in dishes for home cooking. The final cassava flour is just as nutritious as are the roots. The process is characterized by a high yield and low consumption figures.